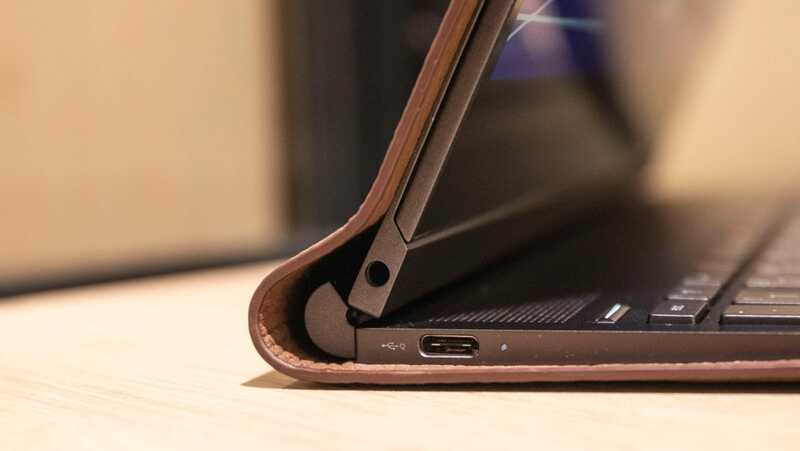 The HP Spectre Folio is deceptive. Closed it looks like a fancy leather folder business types take to conference rooms. Held in your hands, it’s smooth and rich feeling under your fingertips, but heavier than you’d expect. 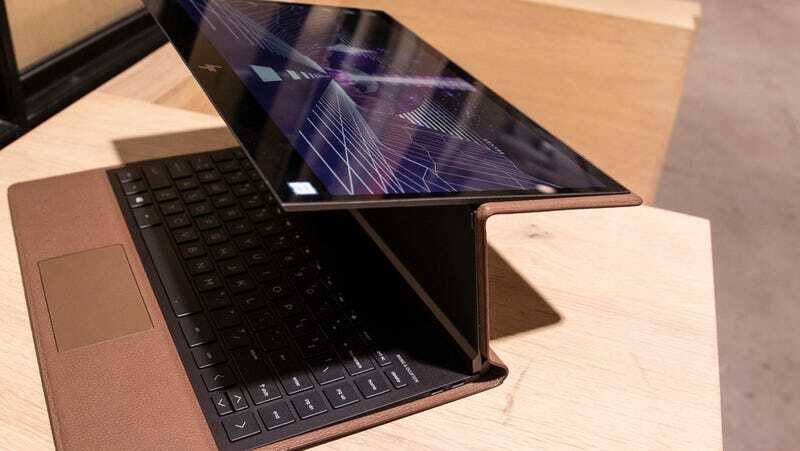 It opens exactly as a laptop should, but then when moving it into its tablet mode, you find you’re pulling the display towards yourself instead of doing 360-degree gymnastics. It’s weird. Confusing. But also natural? If laptop makers are dead set on making laptops double as tablets, then this one’s figured it out. WHAT IS IT? A truly ingenious take on the 2-in-1. LIKE: A brilliant design and great battery life. DISLIKE: Just too expensive to for the speed you get. A little too much leather. 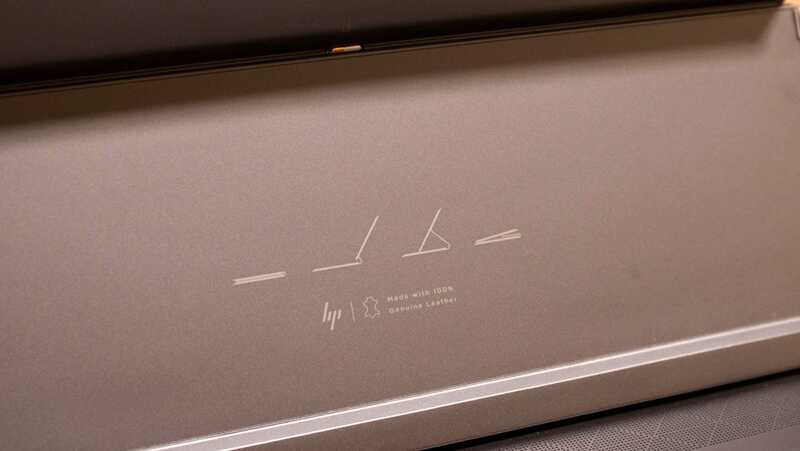 The HP Spectre Folio is a new laptop in HP’s Spectre line up. Comparable in design to devices like the Surface Laptop 2 or the Lenovo Yoga c930, Spectre laptops are meant to be a reasonable blend of price and luxury that skates in below the price of a similarly configured laptop from Apple. They’re Windows devices that shouldn’t feel dorky or cheap to use, and the Spectre Folio is neither dorky nor cheap. Well – except when it’s closed. Then it looks like the folio my brother took around with him in a briefcase for all of the fourth grade. He thought he was cool. He was not. 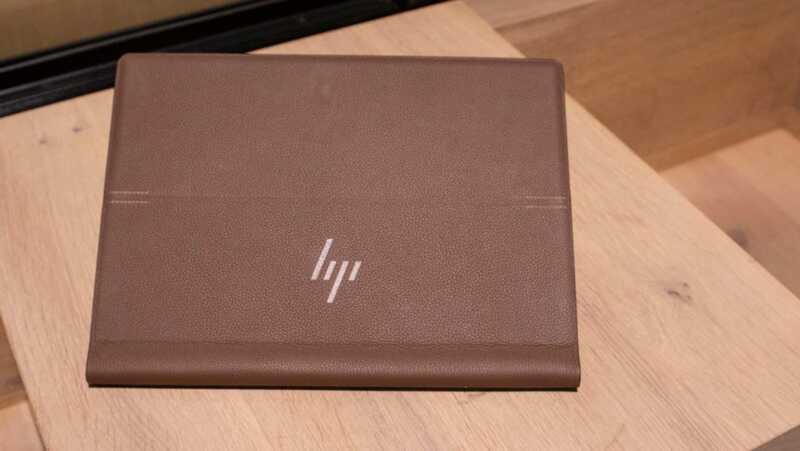 When I saw the Spectre Folio at HP headquarters in Houston in September, HP pointed out that it’s a laptop made of leather. The leather is crucial to the engineering of the device and provides intriguing and appealing quirks that I don’t mind (more on both of those in a minute), but it also feels a little in your face. There’s a thick seam where the leather bonds together just past the point of the magnesium components throughout the body of the device, and there’s a little excess leather wrapped around the primary hinge. Laptop design – especially in this particular premium space – is all about minimalism: aluminium unibodies and millimetre thick bezels. In this context, the leather feels excessive, and a little trimming would be nice. There’s a bit of a leather gap in the back. But using leather as a primary component? That actually works well. 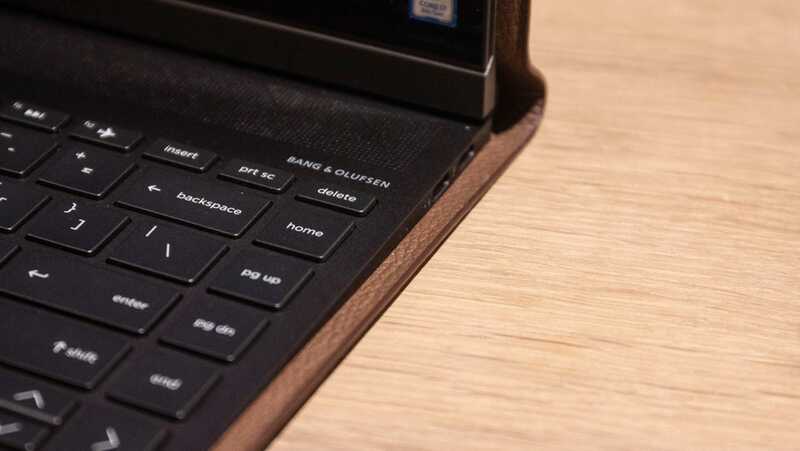 The heat of the laptop dissipates through the keyboard, speaker grill, and then through leather itself and it does such a nice job you’ll find yourself annoyed at all these laptops with plastic or aluminium bottoms. They’re likely to burn your bare thighs at 110-degrees Fahrenheit, while the Spectre Folio is more like a warm hot pad at the same temperature. It’s sort of like when you hop in a hot car. Yeah, the leather seats are not pleasant, but they won’t blister your skin like the metal accents on the steering wheel will. 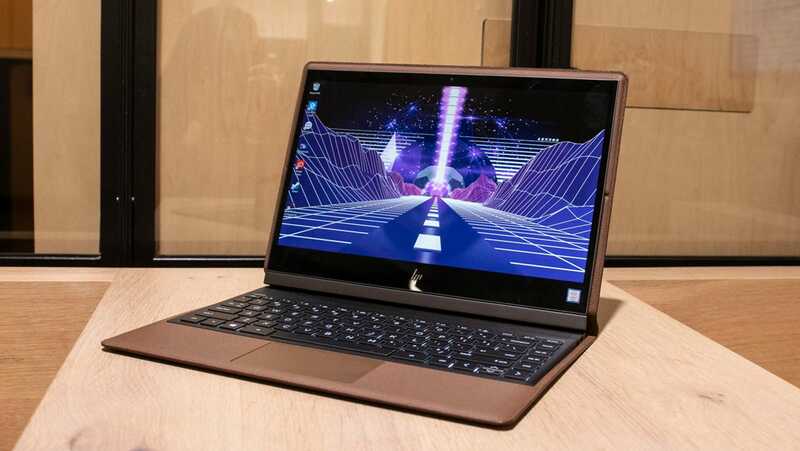 Much as I like HP’s decision to go with a leather enclosure, I can’t say I agree with its choice to use 8th-generation Y-series processors – the low powered, dual-core chips Intel introduced in August that are slower than the U-series found in the Spectre Folio 13's rivals. The Spectre Folio 13 is available for £1,500 with an i7-8500Y CPU, 256GB SSD, and 8GB of RAM. I had hopes for a secret fourth mode where you stare down at the display, but the keyboard doesn’t work outside of laptop mode. This thing works great when I’m tooling around in Chrome or Microsoft Edge and Slack – you know, basic web browsing – but it’s a lot less zippy when I open up Photoshop or try to play a round of Gwent which is bared out in our benchmarks. In WebXPRT 2015, a synthetic benchmark that provides a score for how quickly a device handles a number of browser-based tasks, the Spectre Folio 13 scored a respectable 461. That’s just well below the Yoga c930 (523), but actually above some other, more powerful laptops with U-series CPUs, like the Microsoft Surface Laptop 2 (392). But in Civilizations VI, where we set the resolution to 1080p and the graphics settings to high, the Spectre Folio took a terrible average 282 milliseconds to render a frame. That’s about twice what you’d see from the similarly priced Laptop 2 or Yoga c930. So it’s not especially fast, and as reviewed its $1,500. What’s so good about it then? First that hinge and second, the battery life. It managed a very nice 12 hours and 22 minutes when streaming a 1080p YouTube video at 200 nits brightness. That’s far above the big majority of Intel laptops, including the Surface Laptop 2 (7:57) and Yoga c930 (9:45). 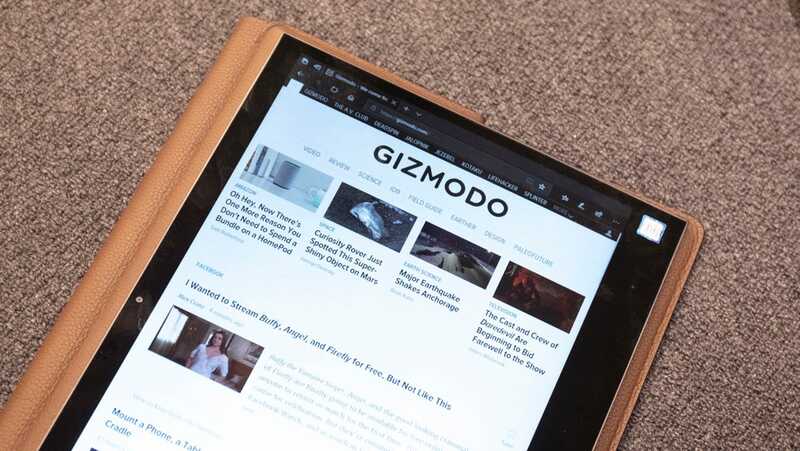 At over twelve hours, it’s more in line with slower Qualcomm-based laptops like the Samsung Galaxy Book 2, or tablets like the iPad Pro. 13.3-inches makes for a big tablet, but the large bezel makes for a comfortable grip while reading. Which makes sense. This thing isn’t for people trying to crank out a project for work or school. It’s for the people reviewing that project as they hop on a cross-country flight or sit in a boardroom getting paid all our salaries combined. It’s a slick laptop that can convert into a tablet – but for well-paid suit types. The transition is smooth. Practically perfect. Finally, there’s a device that functions well as a laptop but doesn’t compromise quite as much when going into tablet mode. If you’re an artist, the tablet mode may take some getting used to. It’s practically perfect – not actually perfect. The display doesn’t lie flat against the keyboard, but at an angle, all that leather adds to the bulk. For someone like me, who only goes into tablet mode when I’m reading or playing a card game, it’s perfectly fine. I can settle it in a pillow on my lap just as easily as the Surface or my iPad. The difference is that when I need to shift back into work (laptop) mode, its a lot easier to accomplish getting back into laptop mode with the Spectre Folio 13 than any other device. But would I recommend you go out and buy it? That’s tougher. This device is flashy enough to warrant its price but slow enough that it feels too expensive for most people. Asking £1,500 – £500 more than an iPad Pro or a Surface device is a tall order. And for £1,200 you can get the much faster Lenovo Yoga c930. Yet the Yoga c930 – which we really like – just isn’t as elegant as the Spectre Folio 13, and it doesn’t have the same remarkable battery life. If you’re spending all your time in meetings and you can afford it, the Spectre Folio is your choice, but that’s not most of us. Here’s hoping its great design innovations trickle down to more affordable laptops. The all leather body will have you annoyed with metal and plastic competitors. But there’s a lot of leather. £1,500 feels too expensive for a Y-series machine.